London, Lefevre Gallery, Recent Paintings by L.S. Lowry, June-July 1964, no. 18. 'In the 1960s, the artist made a number of brief annual visits to South Wales. He went with a friend to visit a fortune-teller in the Rhondda Valley. 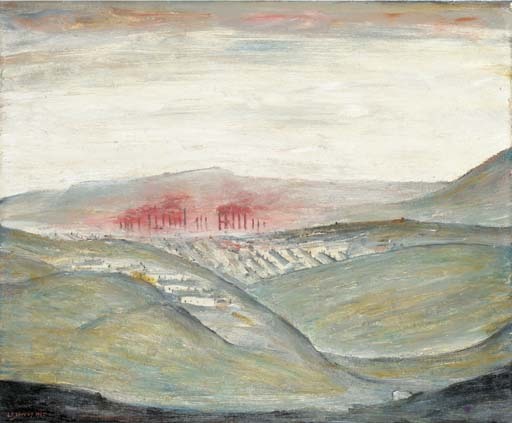 But inevitably the grandeur of the industrial areas made a great impression on him and he produced variations on the theme of the northern urban industrial landscapes which by contrast often exhibit a curious rural flavour' (see M. Levy, L.S. Lowry R.A., Royal Academy exhibition catalogue, London, 1976, p. 86). The fortune-teller, Mrs Flook, lived in Abertillery. During the course of their meetings Lowry was impressed by her knowledge of his life, although he never disclosed in detail what she had told him (see S. Rohde, L.S. Lowry A Biography, Salford, 1999, p. 372-74).